This lounge chair is awesome and amazing. I absolutely adore rocking back and forth for countless hours. My kids love to play on the chair too. Enjoy the the cool winds outdoors as you relax on this white rocking lounge chair. 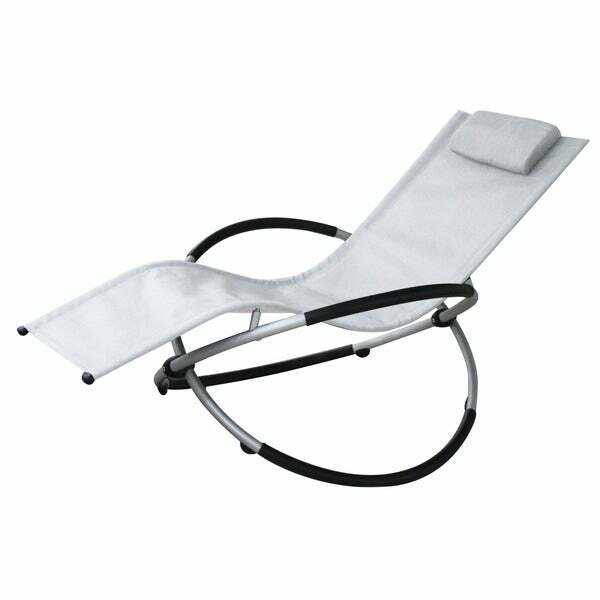 Oil- and UV-proof, this water-resistant rocker features an aluminum frame with white textiline complemented by a small pillow for total relaxation. Don't sit on this piece of furniture if you weigh more than 50 pounds. Pretty but basically a piece of art in my garden. Come apart if any of us try to sit on it. ver very nice! comfy! contemporary! "Does the chair fold up for storage?" Yes, the chair folds sideways for storage.